May | 2015 | Can Men Cook? Oh, the simple pleasure of a naughty cakey, sweetie thing. Sometimes you do need a treat. And here’s a really simple one – with the only difficult task being the chocolate melting bit. You do need to stir it a lot when this is happening. First you need to break up the chocolate into a Pyrex mixing bowl or a metal mixing bowl. This need to be able to fit over a saucepan of just boiling water – over a low heat. You need to stir the chocolate around with a wooden spoon until it is melted. Add the butter in smallish chunks as soon as the chocolate starts to melt, and keep stirring until you have a shiny liquid. Beat the eggs and the sugar into the melted chocolate mixing bowl – you can take it off the heat now. You can do this with a whisk or just a fork. A whisk (balloon or mechanical) is easier, especially for the next bit. You now add in the flour, salt and chocolate chips, mix it all in, and then spread it in a well greased (butter or margarine) baking tin. I like to cut a piece of grease proof paper into the tin and to grease that, because it makes it easier to lift the cooked brownies out – and makes washing up easier. All the recipe books specify a size – about 20 x 20cm. 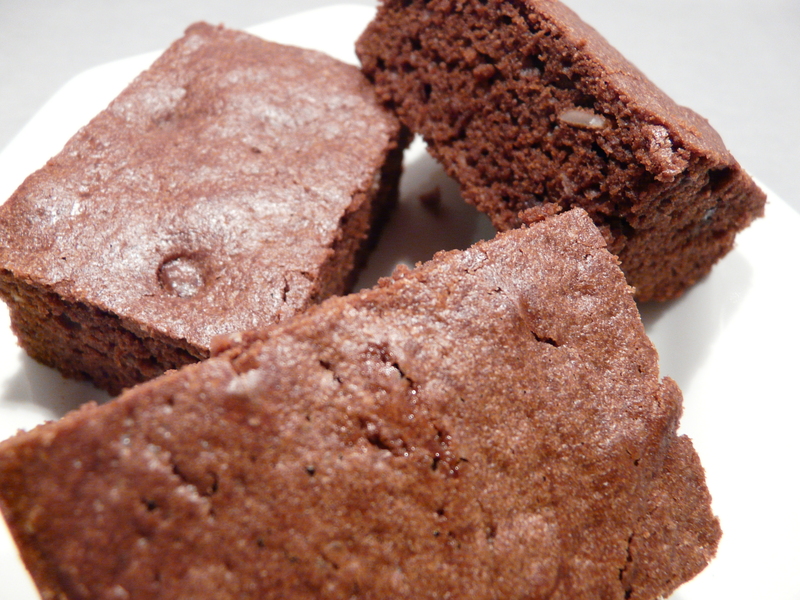 My tins are mainly oblong – so about 12cm x 32cm makes slightly fatter brownies – which in my book are no bad thing. Cook in medium oven – about 165ºC for fan oven, 180ºC for conventional or gas mark 4 for a gas oven. After about 30 minutes they will have a nice crumbly looking crust on them. Let them cool a bit on a wire rack, while you make a cup of tea or coffee to celebrate with.